“BEST OF BOTSWANA” offers guests the opportunity of starting and ending off in proximity to the remarkable Victoria Falls, as well as seeing Mkagadigadi and Sua- the world’s largest salt pans, the unique wilderness that encompasses Nxai Pan-one of the least visited areas in Botswana and the pristine wetlands of the Okavango. This serviced mobile safari entails a 14 day tour through wildlife areas…Nxai Pan, Moremi Game Reserve,Okavango and Chobe National Park,with diverse habitats ranging from semi-arid drylands to lush woodlands and riverine forests. Days are spent game-driving across vast areas, in search of the tremendous variety of animals Botswana is well known for-from African Wild Dogs to huge herds of Elephant, the elusive Leopard, Prides of Lion and good variety of Antelope. A total of ten nights are spent inside game-reserves and because the number of guests are well-controlled and limited-very few vehicles and other signs of civilization. Only private sites are utilized to set up our well-appointed camp. Tour costs start from US$3310-00 pp. Days 5 & 6: Depart Maun and Drive to the Xakanaxa region, Moremi Game Reserve (B. L, D). Days 7 & 8: Nature drive and transfer to the Khwai Region, Moremi Game Reserve (B, L, D). Days 9 & 10: Nature drive/ transfer to the Savuti region, Chobe National Park (B, L, D). Days 11 & 12: Nature drive/ transfer to the Chobe River region, Chobe National Park (B, L, D). Day 13: Nature drive and then transfer to Zambezi Waterfront Lodge, Livingstone (B). DEPARTURE POINT IS WATERFRONT HOTEL (Livingstone, Zambia). Guests are required to be at the reception at 08h00 on day 1. Guests depart Livingstone by road transfer (07h00) and cross the Zambezi River into Botswana at Kazungula, where the borders of Zambia, Namibia, Zimbabwe and Botswana meet. After customs and immigration formalities, you will meet your guide, before driving south to the village of Nata, which is situated on the edge of the Madgadigadi Salt Pans. These Salt Pans, the world’s largest, are the remnants of a once massive inland lake. Today they offer spectacular scenery and endless horizons. In season a large variety water birds nest here. The pans offer a truly unique camping experience as well as an opportunity to witness an unforgettable sunset. We leave Makgadgadi Salt Pans quite early ,after a light breakfast. Our journey takes us westwards to Nxai Pan National Park. The area is known for large herds of Springbok and Gemsbok, species that are not water dependent. The artificial water-hole at the heart of the pan allows for some remarkable wildlife sightings. Nxai Pan is an ancient lake-bed scattered with islands of Acacia Trees. The Pans have changed little in thousands of years and offer a place to totally lose oneself in limitless wilderness. Camping for the next two nights is in Nxai Pan National Park, with afternoon and morning game-drives. We start with a light breakfast in the cool early hours of the morning, heading out at first light. The drive typically lasts until about 10:30 am, with a coffee break mid-way. On return to our private camp a brunch is served, after which there is an opportunity to have a siesta throughout the heat of the day. As the air starts to cool towards late afternoon, we embark on our after-noon game drive. Today we take a gamedrive out of Nxai Pan National Park and journey on further west into the frontier town of Maun, to our hotel which has a pleasant eating area with a welcome swimming pool. The afternoon is at leisure at the Hotel, which is situated on the banks of the Thamalakane River.Lunch and Dinner are at guests own expense. We make our way to the banks of the Okavango River along game-drive routes in the early morning. Today we explore the clear channels, lagoons and rivers of the Okavango Delta by motor boat , going upstream through a myriad of crystal clear waterways lined with African Mangosteen and Water Berry Trees, as well as swaying seas of papyrus. We follow the Okavango River through the Lagoons of Xaxanaxa and Gadikwe, deep into the permanent waters of this unique inland delta. Birdlife is prolific-Kingfishers, Fish Eagles,Ducks and beautiful Pygmy Geese being regularly seen.After a picnic lunch, we make our way back downstream to the mainland for the short evening drive and dinner. The team breaks camp and we take a leisurely drive to our private campsite in the Khwai River area of Moremi Game Reserve. This region’s diversity of animals is truly astounding. Moremi was proclaimed a conservation area in 1964-the result of this foresight is that Moremi is quite rightly been rated as one of the best game-viewing areas in the world. 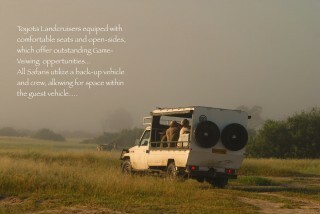 Today is spent on early morning and afternoon game drives. Your guide will generally spend maximum time on game-drives, depending on what is seen, trying to cover as much area as possible. The result of this is guests are given the best chances of seeing a variety of wildlife-although there is of course, that obligatory siesta during the hottest part of the day ! We leave Moremi, crossing the Khwai Bridge to the northern bank of Khwai River, we will make our way to Chobe National Park. Due to the fact that none of Botswana’s wildlife areas are fenced, game can move freely between these two wilderness areas. Hippo, Elephant and sometimes Lion are often found on this route. Moving through the Mababe depression, we relocate to Savuti where we camp in the region of the Savuti Channel. Game viewing this afternoon takes place along the fringes of the marsh and surrounding water holes. The area is best known for large populations of Bull Elephants-and Prides of Lion that patrol the banks of this enigmatic channel. We journey north toward the Chobe River ,the second biggest river in Southern Africa (Zambezi in the largest).Chobe River is home the world’s largest Elephant herds; large numbers of big game such as Buffalo, Hippo and Lion can be seen here. Gamedrives are taken in the afternoons and mornings to find the remarkable variety of species that are drawn to this permanent water source. After an early start, we take a slow drive along the southern bank of the Chobe River, where we can find Chobe Bushbuck and Puku Antelope. The sheer variety of animals, in abundance, make this region a must-see for any wildlife enthusiast.In the afternoon, guests might choose to go on an optional afternoon boat cruise along the Chobe River-perhaps the last river where one has a fair chance to see Lion and Elephant, Leopard or Wild Dog from the unique viewpoint of a boat. We have a leisurely start this last camping morning and say fond farewells to our efficient back-up and camp crew after breakfast.We head eastwards on a last gamedrive to the exit-gate at Sedudu Valley. From there it is a short drive to Kazungula Border Post, where your Safari Guide will ensure that your transfer back to Livingstone is seamless, before leaving to lead another safari.This afternoon can be spent exploring one of the truly magnificent sights on earth-the wonderfully beautiful Victoria Falls-300 feet high and over a mile wide! Witness the power of nature as an average of 550000 tons of Water thunders into the Zambezi Gorge every minute. Optional activities and Victoria Falls Entrance at guests own expense. Overnight is usually at the Zambezi Waterfront. Please note that the entrance fee to Victoria Falls is not included within this safari. After breakfast the safari arrangements end. Before proceeding with onward arrangements, guests might want to partake in the numerous optional activities that are available in this adventure capital! Use of specially modified 4×4 vehicles. Professional Guide and Back-Up Crew. All camping on a fully-serviced & non-participation basis in private campsites. Accommodation on a shared basis. Botswana National Parks and Game Reserves entrance fees. Open Vehicle Gamedrives in all National Parks and Reserves. Lodge accommodation Maun (Day 4) and Livingstone (Day13). Any gratuities, any personal expenses, visa fees, departure taxes. Pre and post tour accommodation and transfers.